You are currently browsing the tag archive for the ‘perfect human’ tag. Recent news of James Watson’s auction of his Nobel Prize medal has unearthed a very unpleasant memory for me. In March 2004 I attended an invitation-only genomics meeting at the famed Banbury Center at Cold Spring Harbor Laboratory. I had heard legendary stories about Banbury, and have to admit I felt honored and excited when I received the invitation. There were rumors that sometimes James Watson himself would attend meetings. The emails I received explaining the secretive policies of the Center only added to the allure. I felt that I had received an invitation to the genomics equivalent of Skull and Bones. Although Watson did not end up attending the meeting, my high expectations were met when he did decide to drop in on dinner one evening at Robertson house. Without warning he seated himself at my table. I was in awe. The table was round with seating for six, and Honest Jim sat down right across from me. He spoke incessantly throughout dinner and we listened. Sadly though, most of the time he was spewing racist and misogynistic hate. I remember him asking rhetorically “who would want to adopt an Irish kid?” (followed by a tirade against the Irish that I later saw repeated in the news) and he made a point to disparage Rosalind Franklin referring to her derogatorily as “that woman”. No one at the table (myself included) said a word. I deeply regret that. One of Watson’s obsessions has been to “improve” the “imperfect human” via human germline engineering. This is disturbing on many many levels. First, there is the fact that for years Watson presided over Cold Spring Harbor Laboratory which actually has a history as a center for eugenics. Then there are the numerous disparaging remarks by Watson about everyone who is not exactly like him, leaving little doubt about who he imagines the “perfect human” to be. But leaving aside creepy feelings… could he be right? Is the “perfect human” an American from Chicago of mixed Scottish/Irish ancestry? Should we look forward to a world filled with Watsons? I have recently undertaken a thought experiment along these lines that I describe below. The result of the experiment is dedicated to James Watson on the occasion of his unbirthday today. 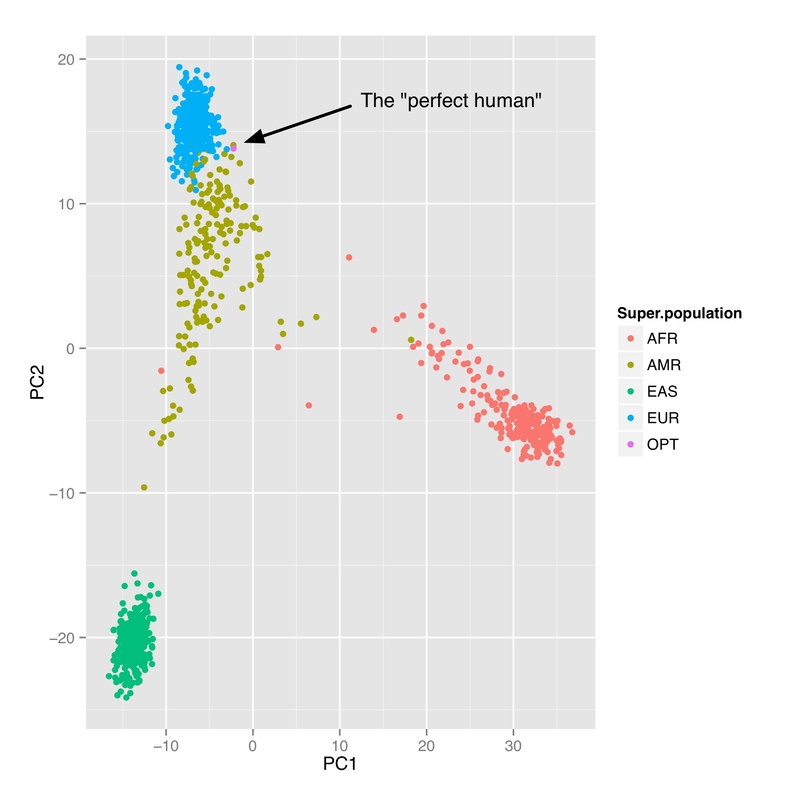 Create a “perfect human” in silico by setting the alleles at all SNPs so that they are “good”. 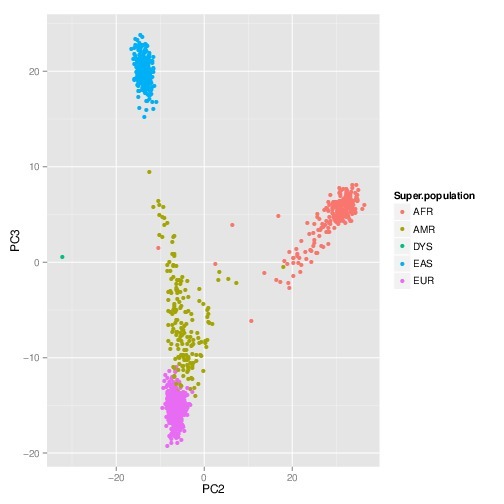 Add the “perfect human” to a panel of genotyped individuals from across a variety of populations and perform PCA to reveal the location and population of origin of the individual. 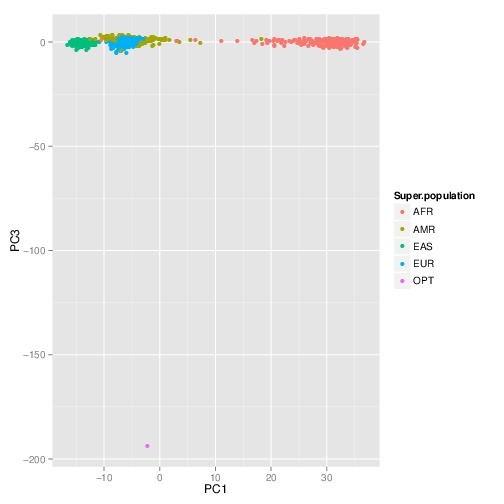 After restricting the SNP set from SNPedia to those with green painted alleles, i.e. “good”, there are 4967 SNPs with which to construct the “perfect human” (available for download here). 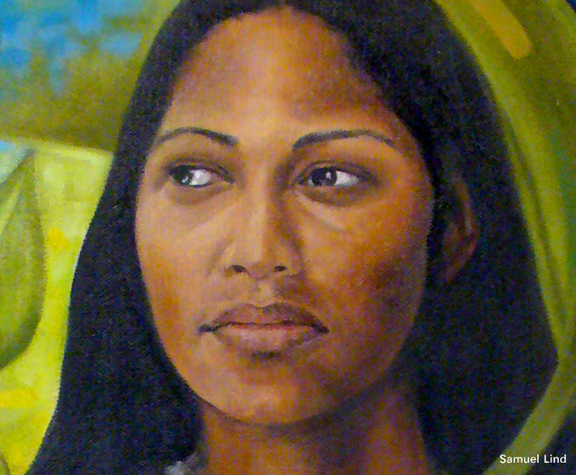 A dataset of genotyped individuals can be obtain from 1000 genomes including Africans, (indigenous) Americans, East Asians and Europeans. The fact that the “worst human” does not project well onto any of the principal components whereas the “perfect human” does is not hard to understand from basic population genetics principles. It is an interesting exercise that I leave to the reader. As for Watson, it seems fitting that he should donate the proceeds of his auction to the Caribbean Genome Center at the University of Puerto Rico.